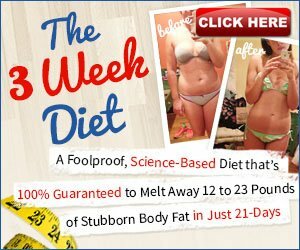 There are a lot of different procedures and products that we are told we need to do or buy in order to ensure our health is maintained or improved. Unfortunately, many of these have unattainable price tags or time requirements, and we are forced to forfeit them at the cost of our health. One of the most time- and cost-effective methods to improve your health is simply by exchanging your current manual toothbrush for an electric one such as the Philips Sonicare Healthywhite. While you may think that exchanging a toothbrush is too simple a way to greatly improve your life, you would be mistaken! While the initial price of these models (suggested retail $119.99, although Amazon offers a greatly discounted price) may be a bit more than you would like to spend, you will be saving much more than that in reduced payments at the dentist’s and doctor’s offices! Who is the Philips Sonicare HealthyWhite Intended For? By switching to a Philips Sonicare HealthyWhite, most people will be able to see an immediate difference in their tooth and gum health. The HealthyWhite is not the most advanced electric toothbrush Philips has to offer. Instead, the HealthyWhite is a lower-budget option that still offers a fantastic cleaning experience for those who have decided that they do not need all the bells and whistles of some of the more advanced options. This model is designed for daily use, and targets specifically individuals who want to whiten their teeth, as it offers a specialized 30 seconds of a whitening cycle at the end of each brushing session. An additional mode is available for those who have sensitive teeth and gums. This product is not recommended for children or others who may have difficulty using it properly unless they are supervised by a caregiver. What are the Health Benefits of the Philips Sonicare HealthyWhite? The Philips Sonicare HealthyWhite electric toothbrush makes use of a special brushing motion – the toothbrush head moves back and forth in order to remove everyday stains in an efficient manner. By using an electric toothbrush, users are able to remove significantly more plaque than with a manual toothbrush. This, in turn, leads to improved tooth and gum health and can help to prevent future cavities or gum disease. The HealthyWhite specializes in tooth whitening – while not a health benefit, it is a cosmetic benefit that many may find attractive when purchasing an electric toothbrush. What sets the Philips Sonicare HealthyWhite apart? 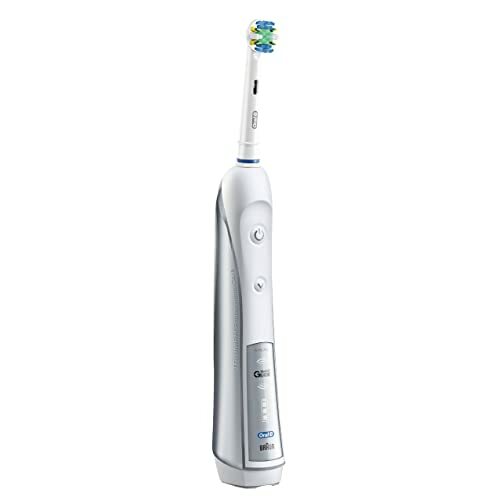 The Philips Sonicare HealthyWhite is an excellent mid-range electric toothbrush. Its handle features an ergonomic design which is lighter and vibrates less than comparable models. As well, the HealthyWhite offers two unique modes for brushing – the “clean” and “sensitive” modes are two-minute cycles that take care of plaque removal, while the “whiten” mode is a 30-second cycle intended for daily use that has demonstrated visible results in as little as two weeks. A two-year limited warranty is included with purchase. How User-Friendly is the Philips Sonicare HealthyWhite? A number of features are included in the Philips Sonicare HealthyWhite to ensure that users are able to use this model to its full potential. One of the best innovations that Philips has included with this model is the “Easy Start Mode”. This setting allows new users unfamiliar with the sensation of an electric toothbrush cleaning to gradually increase the power of the unit over fourteen days of use. Additionally, the toothbrush has an integrated Quadpacer timer that indicates with a short beep and pause when you should be moving on to the next quadrant (half in the “clean” mode) of your mouth in order to make brushing most effective. Two different HealthyWhite Brush Heads are included – a ProResults Standard Brush Head works to clean teeth and massage gums, while a ProResults Compact Brush Head can be used for focused cleaning in areas that are difficult to reach. These brush heads now utilise reminder bristles so that you never forget to buy new brush heads after three months of use. How do Customers feel about the Philips Sonicare HealthyWhite? Very few customers are dissatisfied with their purchase of a Philips Sonicare HealthyWhite. Most customers are overjoyed with the balance between value and features available – even though the price is less than many expected to pay, a basic purchase includes extras such as a plastic travel cap and travel case. Additionally, the design of the brush itself is lauded with praise – the handle has an easy and comfortable grip and the angled brush head enables the user to easily reach all areas of the mouth. The brush head is also smaller than the standard size of brush head that typically comes with electric toothbrushes, which is appreciated by many customers. No customers complained about the noise made by this model – some indicated that it was actually far quieter than they had been expecting! The criticisms of this model are minimal – some users new to electric toothbrushes found it hard to get used to the Quadpacer timer, and to recognize when the shift in vibration indicating a new quadrant occurred. Others experienced some difficulty with the longevity of the product, but the two-year warranty was able to cover many of those issues. Finally, some felt that some of the functions were unnecessary and that their personal dental care routine did not require all of the options present on the Philips Sonicare HealthyWhite. The three different modes available on the Philips Sonicare HealthyWhite all serve an obvious purpose, and it is easy to tell the difference between the different settings – there are no extraneous functions on this toothbrush. 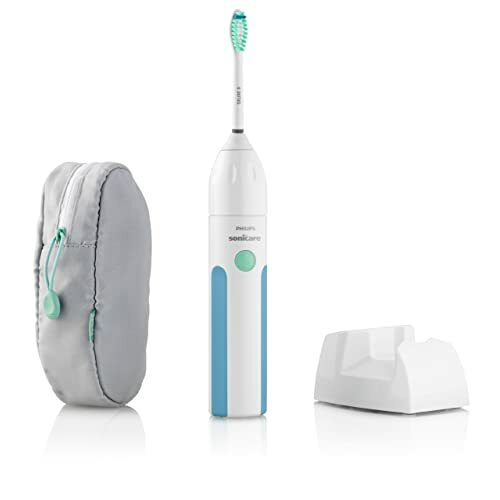 Most customers found that the toothbrush definitely had an impact on the cleanliness of their teeth, and even those that had used electric toothbrushes previously felt that the Philips Sonicare HealthyWhite followed through on its promise that it would give the user a brighter smile within two weeks. It can be difficult to fit in everything you need to into your morning routine. There are so many things that you need to do before you head out the door, and everything seems to be of equal importance! One of the things that you may find yourself skimping on is your dental care regime – forgetting to floss, or only doing a quick brush job with your old manual toothbrush. Unfortunately, this is one of the most harmful parts of your morning routine to skimp on. Electric toothbrushes might be part of the solution to your time crunch problem. While they can’t magically speed up your morning, they do increase the effectiveness of your brushing, and models such as the Philips Sonicare Essence electric toothbrush even include a two-minute timer, so that you can be sure you are not taking any shortcuts with your oral hygiene. Who is the Philips Sonicare Essence Intended For? Switching to an electric toothbrush is a great choice for most people – it is very likely that by trading in your manual toothbrush you will be able to see a significant difference in your tooth and gum health. The Sonicare Essence may not be the most advanced electric toothbrush Philips has to offer, but even as a lower-budget model it is still able to offer a fantastic cleaning experience for those who have decided that they do not need all the bells and whistles of some of the more deluxe options out there. This electric toothbrush has been clinically found to improve the health of your teeth and gums using methods that are safe and gentle on the tissues in your mouth. Investing a little bit of extra time on your dental health care helps to improve the current condition of your teeth and gums while also preventing future cavities or gum disease/sensitivity. This product is not recommended for children or others who may have difficulty using it properly unless they are supervised by a caregiver. What are the Health Benefits of the Philips Sonicare Essence? The Philips Sonicare Essence electric toothbrush uses an angled brush head and dynamic cleaning action to ensure a superior toothbrushing experience to your manual toothbrush. In fact, up to two times the plaque is removed by using this model than by using a manual toothbrush. The reduction of plaque between teeth and below the gumline leads to improved tooth and gum health and can help to prevent future cavities or gum disease. 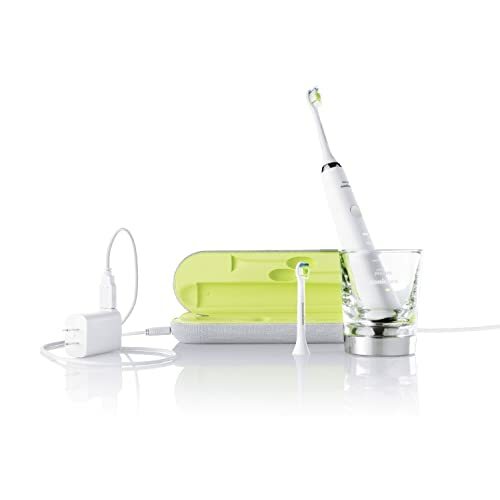 What sets the Philips Sonicare Essence apart? 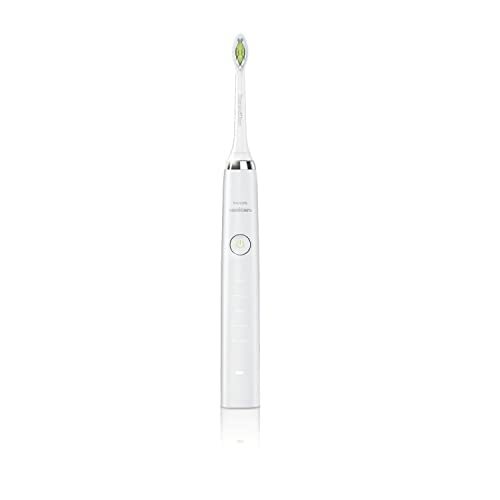 The biggest benefit of buying the Philips Sonicare Essence is definitely the price – suggested retail is only $69.99 USD, but it is possible to find it online for much lower (check it out on Amazon for the best deal). In a market dominated by expensive toothbrushes that make use of advanced technology to provide lots of extra functions the Philips Sonicare Essence is able to hold its own by virtue of its minimalistic design and singular function. While it may not have all the options that more expensive models do, this toothbrush does not cut corners on the features it does offer. The handle itself is soft-grip and weighs only 1.3 ounces, making brushing your teeth a very positive experience. As well, purchase includes a travel case and a two-year limited warranty. How User-Friendly is the Philips Sonicare Essence? It is hard for a toothbrush to get much easier to use than the Philips Sonicare Essence. One of the best innovations that Philips has included with this model is the “Easy Start Mode”. This setting allows new users unfamiliar with the sensation of an electric toothbrush cleaning to gradually increase the power of the unit over twelve uses. The charging station is a simple dock and provides a charge that will last up to two weeks if the toothbrush is used for two minutes per day – long enough for most vacations! An battery indicator is present on the toothbrush itself to let you know when it is time to recharge. The toothbrush also includes a Smartimer – the toothbrush automatically turns off after two minutes, letting you know that you have reached the amount of time recommended by most dentists. The included screw-on Brush Head has an angled neck that helps users reach awkward areas of the mouth such as the back teeth. How do Customers feel about the Philips Sonicare Essence? 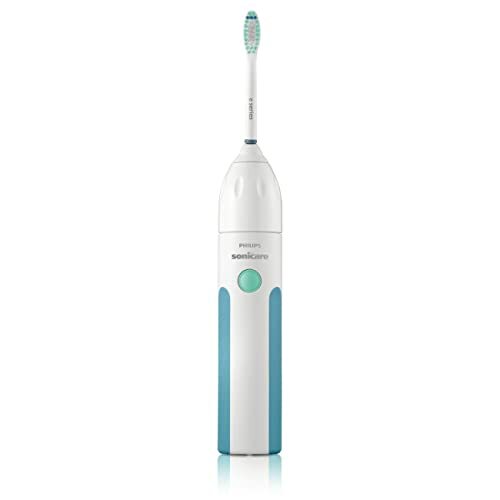 Those who use the Philips Sonicare Essence absolutely love it – this model is the Amazon.com best-seller in the ‘Rechargeable Power Toothbrush’ department. 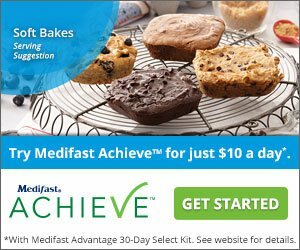 Reviews are overwhelmingly positive, and many users have recommended this product to friends and family members after they saw the results that they were able to achieve (even better, many of their dentists and dental hygienists noticed a difference as well!). Those who use their Philips Sonicare Essence electric toothbrush daily really enjoy the timer, as it keeps them from under-brushing their teeth. 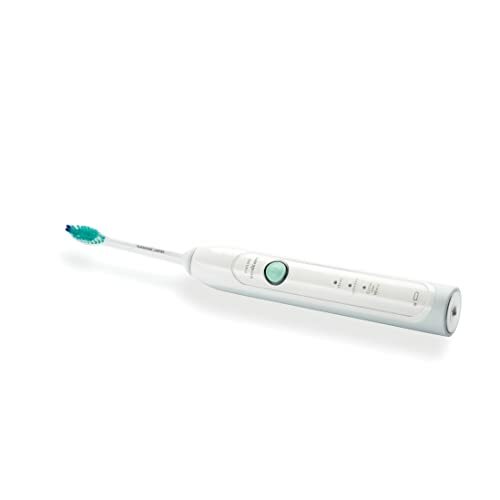 Many users who have tried out multiple models from the Philips Sonicare line have not seen a large difference in the basic functionalities between the Sonicare Essence and the more expensive models – indicating that if all you want an electric toothbrush to do is basic toothbrushing, then this may be the best deal you are going to get! One other concern that is important to be aware of is that the toothbrush does require cleaning, as liquid can linger in the joint between the brush head and the body of the toothbrush. Lastly, it is important to be aware of the fact that this model’s charger only works with 110 volt electrical outlets – a converter will be necessary before you use the Philips Sonicare Essence outside of North America. That being said, if you are someone who expects a lot from your toothbrush, you really are out of luck with this model. Some users expressed dissatisfaction with the longevity of their toothbrush, but the 2-year warranty is often able to help in these scenarios. For only forty dollars, this toothbrush promises excellent maintenance of your dental health – and that is a bargain that is way too good to pass over if you do not care about fancy timers or multiple toothbrushing modes. While you may think that you are doing everything you can to take care of your teeth – brushing twice a day, getting your regular checkup, and flossing with string floss at least five times a week – there is still so much more you can do! Technology is helping to revolutionize even the simplest of dental healthcare tools – the toothbrush – resulting in some of the most effective techniques to keep your teeth and gums healthy without having to add any time to your daily routine. The Philips Sonicare DiamondClean electric toothbrush is one of the top-of-the-line examples of what a difference an electric toothbrush can make in your life. It retails for a suggested $219.99, though better deals can be found right here on Amazon. Who is the Philips Sonicare DiamondClean Intended For? There are few people who would not benefit from switching to an electric toothbrush. The DiamondClean can make a significant difference in the amount of plaque removed through brushing alone – a clinical study found that it could remove up to four times the plaque than a regular toothbrush could. Children, or others who have limited mental or physical abilities should avoid the use of this product, or use it only while under the supervision of a caregiver. The Philips Sonicare DiamondClean has five unique modes in order to provide individual users with the results that they specifically require. These modes include: a standard ‘clean’ mode for plaque removal, a ‘whitening’ mode that aids in stain removal and polishing the front teeth, a ‘polish’ mode for brightening and polishing the front teeth, a ‘gum care’ mode that combines the clean mode with an added minute for massaging the gums, and a ‘sensitive’ mode for those with tooth or gum sensitivity. What are the health benefits of using the Philips Sonicare DiamondClean? High quality electric toothbrushes, such as the Philips Sonicare DiamondClean offer several health benefits that may not be achieved through traditional brushing and flossing (although flossing remains an important component of your daily routine!). This model utilizes special sonic technology that ensures additional cleaning between teeth and under the gum line – this has been shown to improve gum health in as little as two weeks. By investing some additional money and time into your daily dental care routine it is possible to substantially decrease your risk of developing future cavities or gum diseases. If you already suffer from a tooth or gum condition it is likely that making use of an electric toothbrush will aid in your recovery, but you should always check with your dentist first in these situations. What sets the Philips Sonicare DiamondClean apart? Even just from appearances the Philips Sonicare DiamondClean electric toothbrush demonstrates why it is worth paying a little bit more for than the average electric toothbrush. Instead of a clunky cheap-looking design, the DiamondClean makes use of a slim white design featuring chrome accents. Dual charging options are also a part of the design – the charging station for use at home is a minimalistic glass and chrome base with an illuminated display that exhibits the mode currently selected. While traveling, an attractive green and chrome charging case offers a way to keep your brush heads and handle clean while also allowing you to charge your unit through either USB or wall plug. This model is more than just good looks, however. The DiamondClean has a battery life of three-weeks, making it almost as low-maintenance as a classic manual toothbrush. Two different brush heads are available for the DiamondClean – users can choose between a Standard Brush Head for general use or a Compact Brush Head which allows users to focus cleaning power on harder-to-reach areas. How User-Friendly is the Philips Sonicare DiamondClean? Philips Sonicare has made the DiamondClean model virtually seamless for customers to use, even if it is their first time using an electric toothbrush. One of the best innovations they have included with this model is the “Easy Start Mode”. This setting allows new users unfamiliar with the sensation of an electric toothbrush cleaning to gradually increase the power of the unit over fourteen days of use. The travel charging case is another fantastic innovation for this toothbrush, making it much easier to take with you on a business trip or family vacation than a counter-based unit. The slim travel case allows you to charge your toothbrush through either a wall plug or a USB plug – perfect in situations with limited wall outlets. Additionally, the toothbrush has an integrated Quadpacer timer that indicates with a short beep and pause when you should be moving on to the next quadrant of your mouth in order to make brushing most effective. This timer adjusts to fit whichever of the five different cleaning modes is currently selected. How do Customers Feel about the Philips Sonicare DiamondClean? Customers love the design of the Philips Sonicare DiamondClean – its classy charging station and impossibly light (14.4 oz) handle has won over most of those who have made this purchase. The cost is much higher than some would prefer to spend, but it is the top of the line for Philips’ electric toothbrushes, and comes with many more features than some of the lower-tier options. The Philips Sonicare DiamondClean is more than a pretty face, though! Customers are also blown away by how much of a difference using this toothbrush makes in their overall dental health (both with regards to plaque buildup and gum health), and their dentists and dental hygienists agree. The timer-mode has helped many users to increase their brushing time so that they are able to brush for the recommended amount of time, while still reaching all of the difficult-to-access areas. Charging is no issue, especially with the many options for charging this unit, and users love that they have the option to easily transport the Philips Sonicare DiamondClean to wherever their travel takes them. As well, a limited 2-year warranty helps to protect the customer from most issues related to the unit. While brushing and flossing may be a conscientious part of your everyday routine, you may not be doing everything you can for your oral health. While traditional toothbrushes and string floss do make a significant impact on plaque removal, electric toothbrushes such as the Oral-B Precision 5000 have the ability to maintain and improve your tooth and gum health. These toothbrushes may be more expensive than the $3 one you would pick up at the grocery store (even with a steep discount from Amazon.com, you are still looking at just over $100), but the security you will feel in your oral health – not to mention the avoidance of future dental bills! – is worth every penny. Who is the Oral-B Precision 5000 Intended For? This electric rechargeable power toothbrush is an excellent choice for many people. The Oral-B brand is widely respected in the dental health care community – in fact, it is the most recommended brand of toothbrush worldwide. 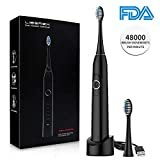 Those who are looking for a daily-use electric toothbrush, an electric toothbrush targeted for sensitive teeth/gums, an electric toothbrush with a focus on tooth whitening, a mechanism that will allow for gum massages, or those hoping for a deep clean will all find a mode on the Oral-B Precision 5000 that fits their needs. This product is not recommended for children or others who may have difficulty using it properly unless they are supervised by a caregiver. What are the health benefits of using the Oral-B Precision 5000? Electric toothbrushes, especially those of a higher caliber such as this model, offer several health benefits that may not be achieved through traditional brushing and flossing (although flossing remains an important component of your daily routine!). The Oral-B Precision 5000 has been found to remove up to 99.7% of plaque when set to its ‘Deep Clean’ mode. This plaque removal is possible even in areas that are harder to access, and harder to clean properly with a traditional toothbrush. What sets the Oral-B Precision 5000 apart? The Oral-B Precision 5000 has an incredible array of settings and features that ensure everyone will be able to find the brushing style most suited to their individual needs. This model provides 40 000 and 8 800 oscillations per minute, guaranteeing significant plaque removal on each use. The base station charges the toothbrush easily, a charge-level display shows you exactly how much battery power remains – each charge is expected to last for approximately ten days. A travel toothbrush case is also provided so that you don’t have to leave your electric toothbrush at home if you are travelling for work or pleasure. Multiple attachment brush heads are available for this toothbrush, including those specific to tooth whitening (Pro White Brush Head), interdental cleaning (Oral-B FlossAction Brush Head), and sensitive teeth/gums (Oral-B Sensitive Brush Head). A timer that doubles as a digital clock is included, and a 2-year limited warranty is offered. Additionally, if you are unhappy with the purchase within 60 days of purchase, a full refund is offered. How User-Friendly is the Oral-B Precision 5000? The design of the Oral-B Precision 5000 was obviously created with the customer in mind. Each part of this electric toothbrush demonstrates an attention to detail that streamlines daily use of the toothbrush, as well as its long-term use. 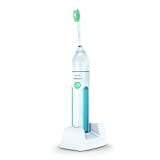 A 2-minute timer is included with the purchase of this model, and has 30-second intervals that help you to use your brushing time most efficiently. The five distinct brushing modes, as well as the interchangeable brush heads provide ample opportunity for individual users to target the toothbrush for the oral healthcare issues that concern them the most. A pressure sensor cleverly acts to stop the toothbrush’s pulses if it senses too much pressure being applied. Lastly, each brush head has Oral-B indicator bristles that fade over time in order to remind you to replace your brush head every three months. How do Customers feel about the Oral-B Precision 5000? Those who have tried the Oral-B Precision 5000 offer very few criticisms – there are 1403 Amazon reviews, and it maintains an average of 4.5 stars! This model is the top-of-the-line for Oral-B, so it really does offer almost anything anyone could ask of an electric toothbrush. Many customers found that the battery indicator was one of their favourite features – no guessing was required as to whether or not they would run out of charge while away from home. The deep clean setting is enjoyed by those who suffer from gum issues and significant plaque buildup. The only concerns expressed by users tended to focus on the size of the brush head, as it is too large for some users to access their back molars easily (although the brush head is smaller than those of competing brands), and the strength of the pulsations are startling for those who have not previously used an electric toothbrush. Other users caution that a converter is necessary for those who plan on taking their Oral-B Precision 5000 on trips to Europe, as the included charger is 110V only. Some customers have also found that the battery in their electric begins to falter after several months. The battery is not unfortunately not replaceable, but the limited 2-year warranty often covers these issues. One of the things to consider about the higher price tag is that a similar quality of tooth cleaning is available on some of Oral-B’s lower-tier models. 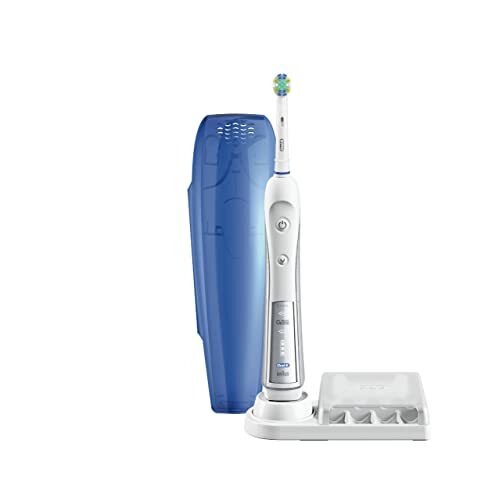 The extra cost associated with the Oral-B Precision 5000 enables users to enjoy the bells and whistles of electric toothbrush technology – the screen that indicates both the timer and battery life, the five separate modes for specific dental hygiene requirements, and increased travel time. It is probably worth some consideration about your dental needs and preferences before you decide which Oral-B model you would like to purchase, although you will not find anything more luxe than the Oral-B Precision 5000.